Today, we are beginning a new series of articles discussing the importance of financial literacy for women. Financial literacy may be more important now than ever, given the increasing complexity of today’s financial and investing world. However, some recent studies indicate that there is a relatively low level of financial literacy among many Americans today. For example, according to the Financial Services Roundtable, 41 percent of U.S. adults (or more than 92 million people) give themselves a grade of C or worse when it comes to their knowledge of personal finance. And the average score among students in the most recent National Financial Capability Challenge, which is an annual, voluntary exam taken by high school aged students, was only 69 percent. Unfortunately, when the data is divided up by gender, women in the U.S. fare even worse when it comes to financial literacy. Financial Finesse, which conducts research on financial trends, recently reported an average gender gap of 15 percent in the answers to key financial wellness questions grouped into seven different financial planning topics (such as investing, money management and tax planning). This is up from a gender gap of 12 percent last year. For example, the report notes that women live an average of five years longer than men, so they have to make their retirement savings last over a longer life span. Women also face higher healthcare expenses than men over the course of their lives and lower average monthly Social Security payments due to less time in the workforce, states the report. In particular, women’s confidence in their retirement preparedness has slipped, and women lag behind men in terms of how much they are saving for retirement, according to the report. The gender gap is largest in the areas of money management and investing, while it’s smallest in the areas of estate and retirement planning. The authors of the Financial Finesse report voiced concern about a reversal in what was a positive trend with regard to women paying off their credit card debt. From 2009 through 2011, women made steady progress in paying off credit card debt in full, but in early 2012, this trend changed course. Another study conducted by the FINRA Investor Education Foundation determined that, on average, women pay a half-point higher interest rate on credit cards than men do. 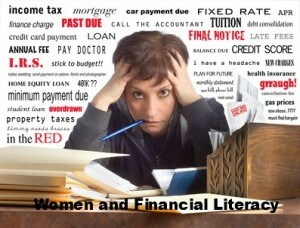 And women with low levels of financial literacy are more vulnerable to credit card mismanagement than are men with comparable levels of financial literacy, according to the report.